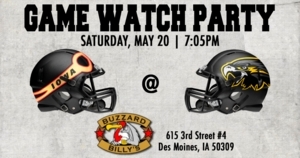 Cheer on the Iowa Barnstormers at Buzzard Billy's this Saturday, May 20 as the team travels to Wichita Falls, Texas to take on the Nighthawks! Enjoy great food and drinks! Kickoff is set for 7:05pm.